The company's size helped push its fiscal fourth quarter higher, and management could be setting it up to consolidate the market. Being as large of a homebuilder as D.R. 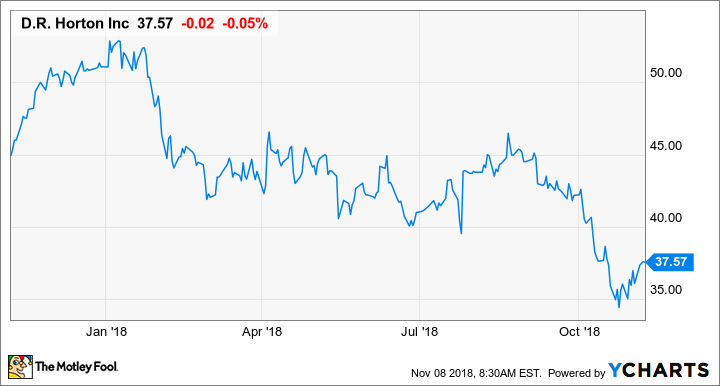 Horton (NYSE:DHI) has its benefits, and this past quarter was an example of how size and scale can come in handy when the housing market starts to look less attractive than it has in recent months. Even though there has been a noticeable slowdown in housing, D.R. Horton produced better-than-expected results to close out its fiscal year and increase its dividend by 20%. As good as this quarter was, though, a company can only fight industry headwinds for so long. So, let's take a look at D.R. Horton's most recent quarter to see how it was able to improve results in a slowing housing market, why management could be positioning itself to make an acquisition, and whether the company will be able to keep producing outstanding results. Data source: D.R. Horton earnings release. FQ = Fiscal quarter. EPS = earnings per share. One of D.R. Horton's greatest strengths as one of the nation's largest homebuilders is that it has an incredibly large backlog of orders. This backlog means that homes closed in this particular quarter were likely ordered several months ago, when the market was much stronger than it is today. As a result, the company was able to grow revenue and earnings by 8.2% and 48.8%, respectively, compared to the same time last year. While operating margins did improve slightly compared to this time last year, the bulk of those net income gains are from the changes to corporate tax rates at the beginning of 2018. Looking up and down the operational results, D.R. Horton delivered a good quarter. The company's pre-tax margin was the highest quarter for the fiscal year, and it resulted in a fiscal 2018 pre-tax margin of 12.8%, which put the company right in the middle of its guidance for the year. The only portion of the company's results that showed any signs of a market slowdown was that net new orders were down 21% compared to the prior quarter. At the same time, though, net new orders for the fourth quarter of 2017 were also down 21% compared to Q3 2017, so that decline could be entirely from seasonal effects. Data source: D.R. Horton. Chart by author. Because of the company's strong margins throughout the year, D.R. Horton was able to generate a considerable amount of cash throughout the year. While it did make a modest number of share repurchases, it was considerably less than other homebuilders, and management has let its cash pile build up to $1.47 billion. Perhaps it's just a timing thing, but not putting that cash to work now suggests that management might have bigger plans for it down the road. In the company's press release, Chairman Donald R. Horton touted the company's ability to perform well despite recent market headwinds. He also acknowledged that the biggest concern in the housing market today, affordability, could affect how the company develops its land and finished lots in 2019. Sales prices for both new and existing homes have increased across most of our markets over the past several years, which, coupled with rising interest rates, has impacted affordability and resulted in some moderation of demand for homes, particularly at higher price points. However, we continue to see good demand and a limited supply of homes at affordable prices across our markets, and economic fundamentals and financing availability remain solid. We are pleased with our current product offerings and positioning to meet demand in the current market, and we will adjust to future changes in market conditions as necessary. Our continued strategic focus is to consolidate market share while growing both our revenues and pre-tax profits, generating strong cash flows and returns and maintaining a flexible financial position. With 29,700 homes in inventory and 289,000 owned and optioned lots to support future growth, we are well-positioned as we begin fiscal 2019. D.R. Horton's results show why size matters in the homebuilding business. This is an extremely fragmented industry, and fighting for customers on affordability means that cost control and having a footprint in a multitude of markets can give a homebuilder the ability to fight on price in some regions without it having a drastic impact on the bottom line. As Horton said in his comments, the company is looking to capture market share and consolidate this industry. With shares of other publicly traded homebuilders selling at incredibly cheap valuations, it looks like a great time to be in a position to acquire others. Buying other companies may not completely offset the effects of a housing slowdown, and management is anticipating a bit of a slowdown in the first quarter of 2019 because of affordability issues. However, being a market consolidator would certainly put D.R. Horton in a better position when the market for housing turns back up again.